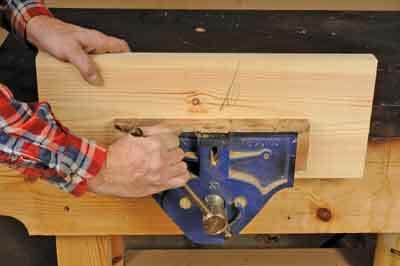 Here are the basics for using different bench planes for specific purposes. Remember that to some extent planes are interchangeable for certain jobs, but you do need to recognise when one is more suited than another for best results. is square in the mouth without too big an opening in front of the blade, the first requirement is for the blade to be really well sharpened for use. 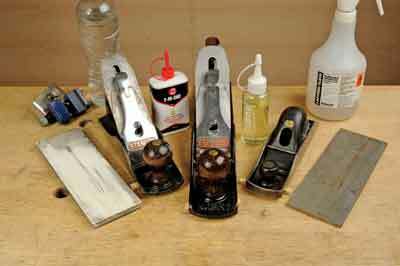 My own current recipe for sharpening a badly worn and damaged blade is to start by using a belt sander to grind the worst of the poor edge away, making sure the blade doesn't overheat by plunging it in cold water regularly. An angle of about 25° is desirable. The belt sander bed is not particularly flat, however, because of the graphite coated cork pad underneath; a large diameter wet stone grinder is better if you own one. 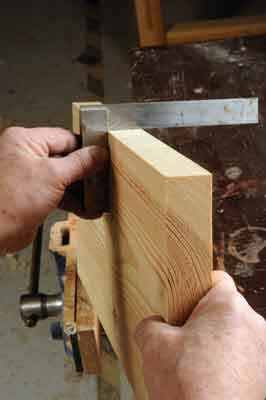 Set the angle by making a mark on the bench that you know gives the correct angle with the right amount of blade showing. This can first be determined by experimenting with a sliding bevel and protractor. 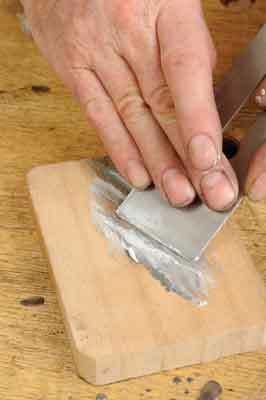 Next, I use a honing guide and a large 205 x 75mm 600 grit diamond plate with water or lapping fluid to get a raw but accurate secondary edge, known these days as a micro-bevel. 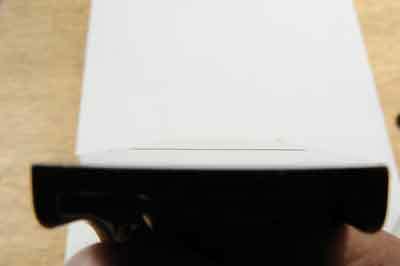 The back of the blade needs to be stroked sideways to remove the worst of the burr as well. 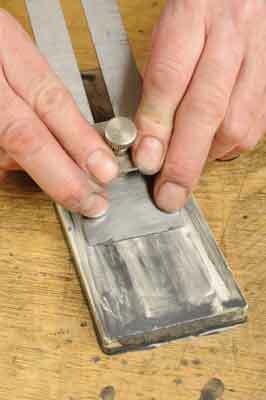 It helps to lift the blade back a fraction to get a clean back face at the very edge. The last stage is using a 1,000 mesh ceramic stone on the bevel again, with water and the honing guide. Note that throughout all these stages you need to check the squareness across the edge with an engineer's square. 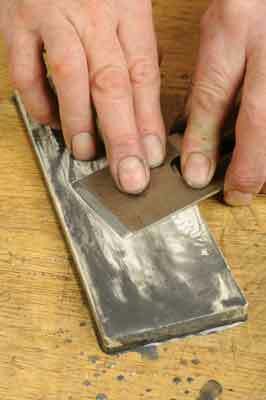 Repeat the process on the back of the blade lifting it a fraction to get a really sharp edge. 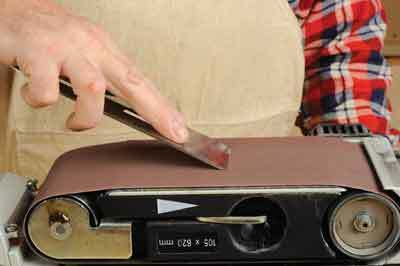 This removes the scratches imparted by the previous two stages and imparts a keen, sharp, burr-free edge. A last worthwhile step is to use a sandwich of end grain faced MDF and fine abrasive paste to polish the cutting edge not just for appearance but to strop the edge to an even finer finish for a cleaner 'razor cut'. Now the blade needs a clean up and rust prevention in the form of an oil. Traditional 3-in-1 type oils are okay but tend to smell and be rather sticky. My preference is for camellia oil sold for tool maintenance and polishing bonsai pots! 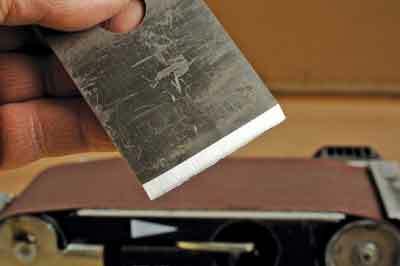 a sharpening stone until it does. 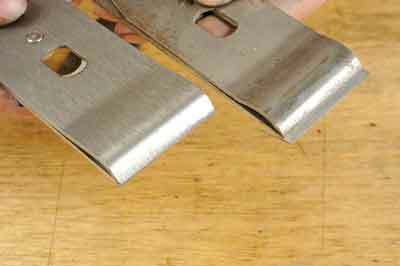 Accepted practice says that the cap iron should be set near to the cutting edge to encourage the shavings to curl as they leave the blade edge. However, there are some proponents who believe the cap should be set further back to give pressure over the rear edge of the bevel. Manufacturers don't allow for this, as you will find when the blade protrudes too far through the mouth. If you refine your technique you may wish to adjust the blade/cap iron relationship and then decide on results for yourself. Mount the blade assembly on the frog and fit the lever cap on top. 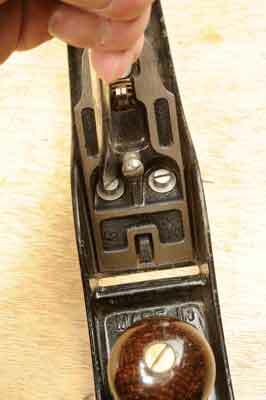 Nowadays some planes have a brass screw-down knob to do the same job of holding the blade in place. Ensure the assembly is centred and square before pressing the lever down to lock it. If the action is too loose or impossibly tight, turn the cap holding screw accordingly until a firm grip is achieved. 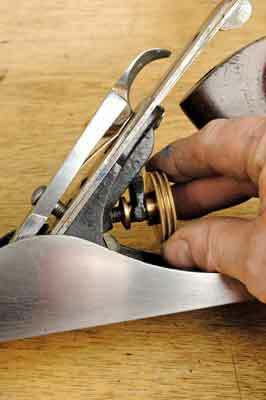 The brass blade adjustment knob behind the frog is turned until the blade protrudes a fraction when sighted along the sole. The knob may need to be turned in a different direction according to the make of plane as they can have left- or right-handed threads. You should see just a very fine black line of blade showing and if ground square and placed in the body squarely then it should need very little lateral tilt. The lateral tilt lever is pushed in the direction you wish to reduce the blade exposure. It should be showing evenly all across the mouth when viewed from the end. 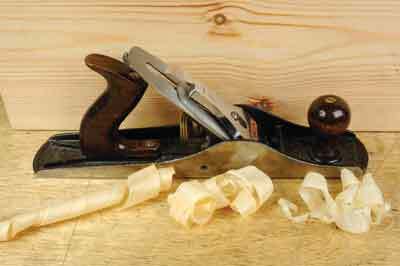 Try your plane on a piece of wood - softwood is a good start- but without any blade jarring knots to contend with. Hold the plane level and see if you can raise a shaving. 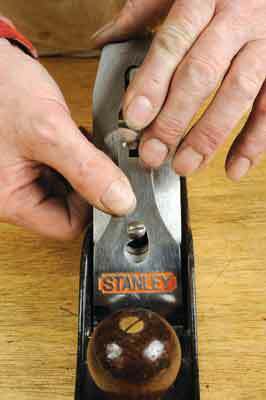 If it doesn't cut then turn the blade knob a fraction to extend the blade and try again. 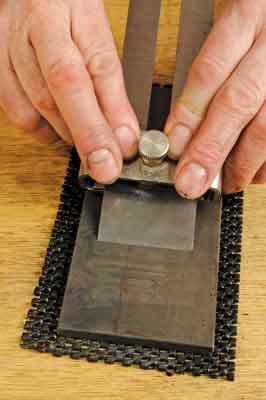 If on the other hand you take thick shavings and meet resistance you need to run the blade into the body a bit. Practice will show you what setting works best. Years ago bench planes were used for major preparation. 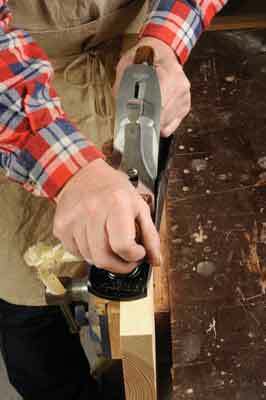 Thus a No.5 jack plane was sharpened with a cambered edge profile to avoid dig-in and speed up the flatting process. Then a No.4 smoothing plane with a straight blade edge but the corners nicked back, was used to smooth out the unevenness left by the jack. 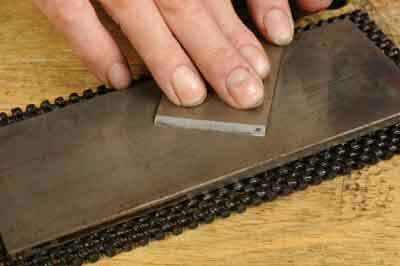 Nowadays we tend to plane narrow components so blade edges are left straight; you may wish to try working to the old regime and experience what flatting and truing boards is like. A lot of this has to do with your stance. If you aren't standing correctly, you cannot move correctly and the plane will fail to deliver a good result. 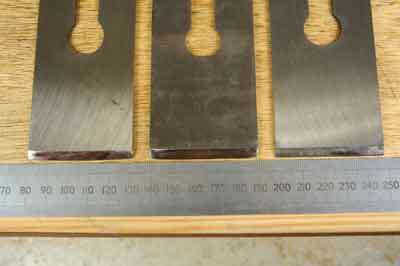 Place the workpiece in the vice correctly marked up to show which faces and edges require the plane's attention. Clamp it tightly and level as you cannot expect to deal with it properly if it is canted at an angle to you. 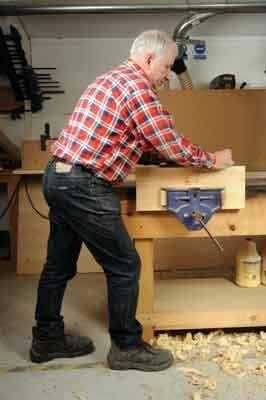 Stand to the side of the bench and towards the front edge of the workpiece, i.e. not beside the centre of it, as you have to push ahead of you. Your legs should be apart a bit to create a solid triangulation - a solid base to push from. However, you should not keep your lower frame rigid but move it forward as you push the plane. 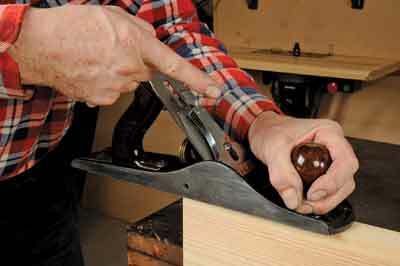 Hold both the rear handle - otherwise known as the tote - and the front knob and press the nose of the plane down on the job. Push forward keeping the plane flat on the workpiece and alter the pressure so the rear handle is being used to follow through while pressing down on it at the same time. 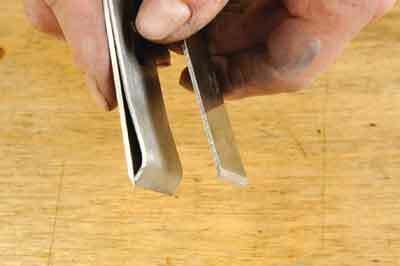 If the blade is set correctly a cut should result but it may be hit and miss depending on how flat the surface is to start with. 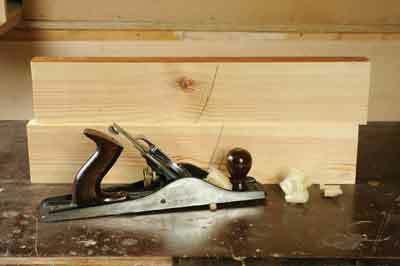 That of course is the purpose of planing, to level and smooth uneven wood surfaces. Repeat the long through planing stroke paying attention to keeping the plane level. Angling the plane slightly as viewed from above will give an improved slicing action. Once you have a continuous planed surface check for level by sighting along it and using a square to check from side to side. If the result is wrong in length plane the errant sections before doing a complete stroke to even the surface up. 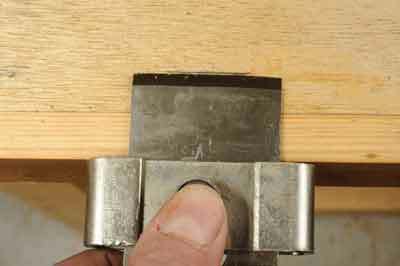 If it is wrong in width tilt the plane a fraction or use the lateral tilt lever to alter the blade angle. Once the error is corrected then revert to a normal through stroke. Once you have managed to achieve a good result try marking accurately around a workpiece and planing so it just meets the line all round. This will help confirm your competence at planing. It takes time to get good results and persistence pays off. An acid test is planing two long meeting edges to make a light tight joint with the boards level to each other.